Florin Andone equalised for Brighton & Hove Albion in their 2-1 away win in extra-time against West Bromwich Albion in tonight's FA Cup fourth-round replay. All pictures by PW Sporting Photography. A double from substitute Glenn Murray fired Brighton & Hove Albion into the fifth-round of the FA Cup after they battled back to beat West Bromwich Albion 3-1 after extra-time in tonight's fourth-round replay. Chris Hughton made ten changes to his Brighton side that drew 0-0 at home to Watford in the Premier League on Saturday, with Yves Bissouma the only player retaining his place. Notable starters included a full debut for 20-year-old Swedish forward Viktor Gyokeres, whilst Iranian winger Alireza Jahanbakhsh made his first appearance since November 3. West Brom manager Darren Moore, meanwhile, made seven changes from the side that were beaten 3-2 at home by Middlesbrough in the Championship at the weekend. Baggies' topscorer Jay Rodriguez, Wales' Euro 2016 hero Hal Robson-Kanu, and academy products Sam Field and Rekeem Harper were the four players to keep their places. The hosts had the games first attempt after eight minutes as a ball over the top from Field found West Brom dangerman Rodriguez. The angle was against the former Burnley man, but he produced a fine shot to force Seagulls 'keeper David Button into a good save. Five minutes later and Button was again called upon to deny Rodriguez. The Baggies striker hit a 25-yard shot that required the Albion 'keeper to turn the ball behind. Brighton had their first shot on target after 18 minutes as Bissouma let fly from long-range, forcing Baggies stopper Jonathan Bond into parrying the ball out for a corner. The Malian midfielder's whipped set-piece found Florin Andone, but the Romanian's glanced header went wide of the post. Brighton then had two gilt-edged chances in three minutes that should have seen them 2-0 up. Their first great opportunity came on 34 minutes. Bissouma played the ball into Gyokeres, and the young Swede's shot from outside the box was parried by Bond back into the path of Andone, but his close-range follow up was deflected over. Brighton's Dan Burn was imperious in the air for the Seagulls. The corner from Anthony Knockaert met the head of Leon Balogun but the Nigerian's free header from four-yards out crashed against the crossbar. West Brom could only clear the ball as far as Jahanbakhsh and the returning wideman fizzed a shot just inches over the bar. The second glorious Seagulls chance came on 37 minutes as Knockaert broke superbly into the Baggies half. The French wingman found Andone in the box but the striker sent his shot narrowly wide of the post. After a great ten minute spell of dominance, Brighton were given a scare two minutes before the break. From 20-yards out, Robson-Kanu connected sweetly with the ball to hammer a swerving volley goalwards but his beautiful shot rattled the bar. With the half coming to a close, the Seagulls did have the ball in the next thanks to an Andone header but his effort was ruled out for offside. Referee Paul Tierney then blew his whistle for half-time, bringing an end to a highly entertaining 45 minutes that Brighton should have been ahead in. West Brom made a tactical substitution at the break in an attempt to nullify the growing Seagulls threat. Despite a threatening opening 15 minutes, Rodriguez was sacrificed for defender Craig Dawson in a bid to solidify the Baggies back-line. The visitors had the first chance of the second-half on 49 minutes. Nutmegging a defender, Jahanbakhsh cut inside and shot but Bond was equal to it to push the attempt away. On 57 minutes Brighton had another chance that was agonisingly close to finding the net. Knockaert found Bissouma on the edge of the area but the Mali man's strike went inches wide of the post. A minute later Dan Burn produced a tremendous, last-ditch sliding tackle to prevent ex-Ireland international Wes Hoolahan from getting a shot away. The Seagulls then had a strong penalty appeal turned down on 66 minutes. Jahanbakhsh went to ground after a tackle from Tyrone Mears, and the West Brom defender seemed to not win much of the ball, but referee Tierney remained unmoved. With just over quarter-of-an-hour of normal time to go, Brighton won a corner after a good Andone cross was hacked away. Burn rose highest from Knockaert's corner but his header went just wide of the post. West Brom had offered very little in the way of an attacking threat in the second-half but, almost inevitably, the Baggies took the lead on 78 minutes in bizarre circumstances. Hoolahan's free-kick was headed up into the air by Burn towards goal. Underneath the ball was Kyle Bartley and Balogun and the Nigerian defender proceeded to just walk away from the high-ball, presuming he would be awarded a free-kick. Left completely unmarked at the back post, Bartley hooked the ball into the net to give West Brom the lead. Goals in this FA Cup tie seemed to be like buses. You wait 167 minutes for one, then two come along at once. The Seagulls needed just four minutes to level things up. An absolute defensive shambles from the Baggies saw Bartley and Dawson dither as they tried to decide between them who was going to clear the ball from danger. Whilst the West Brom defenders were still agonising over the decision, Andone nipped in to claim the ball and fire through Bond's legs to equalise. Extra-time loomed and both side has chances to win the game in 90 minutes. Four minutes before time, Robson-Kanu sent an attempt wide of the far post after a good cross from the Baggies' 18-year-old substitute Rayhaan Tulloch. Brighton thought they had won the game in the second minute of second-half stoppage time but sub Jurgen Locadia's glancing header was ruled out for offside on the Dutchman. This was the last action of the half, as referee Tierney blew his whistle for full-time. Another half-an-hour would be needed to separate the two teams after 180 minutes of football. With the players tiring, the first-half of extra-time saw little in the way of chances. Robson-Kanu found himself in a good position on the edge of the area in the first five minutes, but the Welsh striker played himself into trouble and the attack fizzled out. Robson-Kanu then had to come off due to an injury moments later, reducing the Baggies to ten-men after making all three substitutes in normal time as well as their additional sub in extra-time. West Brom were now looking to sit back and play for penalties but Chris Hughton smelt blood. The Brighton boss replaced the effective but waning Jahanbakhsh with this season's top-scorer Glenn Murray on 100 minutes, and it took the Seagulls target-man just three minutes to make his mark. Two minutes before half-time in extra-time, Locadia twisted and turned on the left before playing a cross into the box. The ball hit Murray, and the striker didn't know much about, but he managed to knock the ball home to give Brighton a deserved lead. As the second-half of extra-time began Hughton replaced the evergreen Bruno with Gaetan Bong, to a chorus of boos from the home supporters, as the Seagulls looked to play the game out. After a quiet opening ten minutes, the hosts had a glorious chance to level. 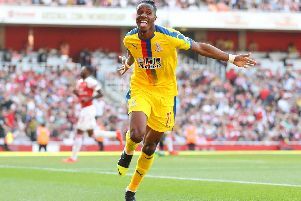 Tosin Adarabioyo's mis-hit shot found 16-year-old substitute Morgan Rogers, but the youngster couldn't get enough on his header and the ball was gratefully taken by Button. With three minutes of the game remaining, that man Murray scored again to put the tie to bed. A composed pass from fellow substitute Davy Propper found Murray and he calmly slotted the ball past Bond to send Brighton into the fifth-round of the FA Cup. The Seagulls will now host Frank Lampard's Derby County in the next round of the cup on February 16, kick-off 12:30pm. West Brom: Bond, Mears, Bartley, Adarabioyo, Townsend, Field, Livermore (Tulloch 63), Hoolahan (Rogers 82), Harper, Rodriguez (Dawson 45, Hegazi 91), Robson-Kanu. Unused: Myhill, Gibbs, Rogers, Gayle. Brighton & Hove Albion: Button, Bruno (Bong 106), Balogun, Burn, Bernardo, Knockaert, Bissouma (Propper 88), Kayal, Jahanbakhsh (Murray 101), Gyokeres (Locadia 78), Andone. Unused: Sanchez, Dunk, Gross.